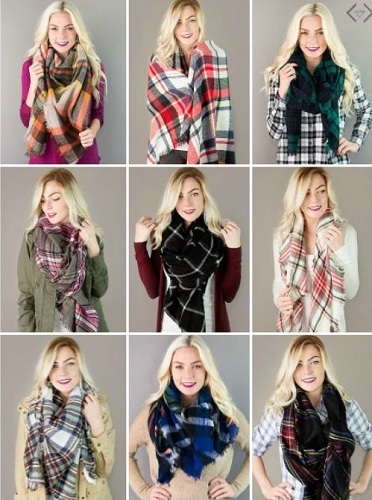 Blanket Scarves Just $12.95 PLUS FREE Shipping! You are here: Home / Great Deals / Blanket Scarves Just $12.95 PLUS FREE Shipping! Oh these just make me think of how cozy they would b=for the fall weather! This is a great deal, too there are so many to choose from – they would make great gifts, too at this price! This weekend you can get Blanket Scarves in 25 different colors for only $12.95 PLUS FREE shipping! Just use code: BLANKET16 at checkout to get yours! The pattern of the season is plaid! We’ve got 25 different colors to match any outfit throughout the season. There’s no better way to wear it than in the form of a beautiful oversized blanket scarf! Available in wide array of lovely color combinations, and countless ways to style them. Pick out a few for yourself, your sisters, your mom, and your best friend. It can be worn in a variety of ways as displayed above and we have also seen it used for fabulous home decor.